Vocalist Amy Alysia is a performer who works tirelessly to claim her place as one of the premier vocalists in Central Florida. Always known for her soulful, heartfelt ballads, impressive vocal range, and unique approach to a song, Amy Alysia always leaves her audience wanting more. Fans say her voice is “like sweet butter,” while others say “her voice is a gift from God”. 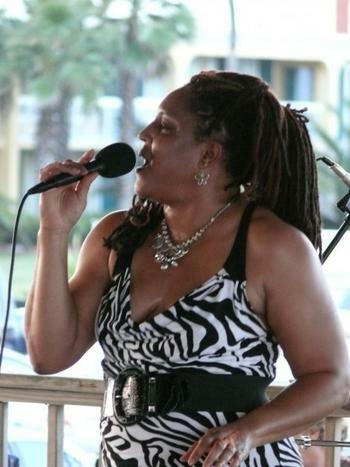 Amy Alysia entertains her audience with a wide variety of Smooth & Jazz Standards, R&b, & Soul, and is not afraid to diversify her song selections that easily sets her apart from other performers. some of her female vocalist that has influenced her includes Anita Baker, Aretha Franklin, Randy Crawford, Natalie Cole, Bonnie Raitt, and Sarah Vaughn. Crowds are captivated with her sound, energy, and especially her ability to incorporate them into every live performance. This musical journey isn’t a new one. Her mother has a cassette tape recording of her singing at the age of 2. “Yes Jesus Loves Me.” Who knew that her humble beginnings in the church and the local school choirs were preparing her for a successful life in music. Amy credits her parents for a strong spiritual foundation, that built her character; junior high school music teacher Earl Thompson for developing her gifts at an early age; & college music director, Roger Sears, who helped develop her confidence. Although she began singing in church, around the age of fifteen she began traveling with local gospel artists singing around the State of Florida. Her senior high school music teacher took interest in her and she began to sing as the vocalist for many weddings, funerals, civic events, and more. Today, She is quickly winning the hearts of local audiences who simply want more! In addition to Amy Alysia’s musical abilities, she completed her college education earning a Bachelors in Accounting, a Masters Degree in Business Administration, and an All-Lines Claims Adjuster Certification, she has decided to pursue her lifelong dreams of singing. With the management and support of her husband Phil Reed, also drummer, she is able to focus 100% on building her brand. Currently, Amy Alysia is working to release her first highly anticipated album to be released soon.